I have a two polygon shapefiles, one shapefile is a zoning and the second one is a census tract. Now I want to calculate distance from boundary of tract to closest boundary of each zone type (R, C, etc). Because of that I have dissolved all zones according to zone type and now I want to have in each census tract information about nearest distance to the all zone types (distance to C, distance to R, etc...). I am using ArcGIS 10.4 and have trid to use NEAR tool, spatial join but I can't get a distances to all zone types, just to the nearest one. 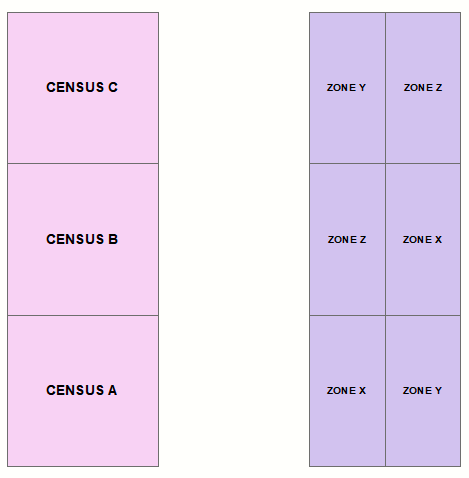 Also I want to have a zero distance value if each tract contain the zone type or intersect it. Use generate near table with unlimited count of matches, e.g. 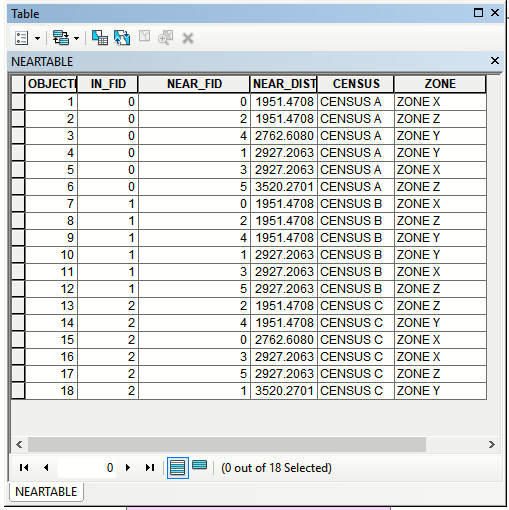 Add census and zone names to NEAR table using IN_FID and NEAR_FID as joning fields. Not the answer you're looking for? Browse other questions tagged arcgis-desktop shapefile polygon proximity or ask your own question. Calculating Closest Distance Between All Combinations of Set of Polygons using ArcGIS for Desktop? Finding distance between neighboring points in ArcGIS Desktop? Calculating distance from a point to all nearby polygons? Determining distances between many individual points using ArcGIS for Desktop? Creating the straight line feature class representing the shortest path between two features using ArcGIS Desktop? Calculating nearest distance between 2 points and creating line between them avoiding barrier using ArcGIS Desktop? Generating a table of distances between points and edges of nearest polygons?